WhatsApp is the most popular instant messaging platform at this time. There are lot of secret WhatsApp tricks which are useful for us. Most of the WhatsApp users don’t know about this given secret WhatsApp tricks. WhatsApp is an important part of our life and it take place of old messaging apps. Recently WhatsApp add few latest features for his users. 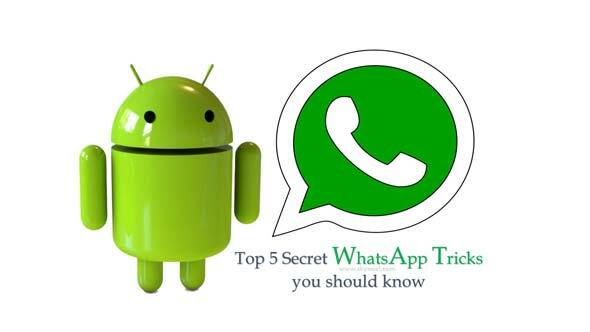 So, in this article we have to discuss about top 5 secret WhatsApp tricks you should know. When we start our days lot of people first have to check his mobile phone and watch all incoming messages. It is daily routine job to check and reply all the received messages on WhatsApp, Facebook and others. Now i am highlighting few famous WhatsApp tricks for all of you. There are lot of WhatsApp users don’t know about these given secrete WhatsApp tricks. You can use these tips and tricks which is very useful for us. Let’s start about the top 5 secret WhatsApp tricks..
All we know when you read the received message on WhatsApp blue ticks appear and sender know that you have read his or her message. If you want to read WhatsApp messages without sender knowledge then you have to take given simple steps. Step 1: Put you phone on flight mode and read the received WhatsApp messages. Step 2: Now again turn on the flight mode and check there is no blue ticks shown at your friend WhatsApp window. Most of the person don’t know that apart of English there are lot of languages you can use for communication on WhatsApp. You can choose any required WhatsApp language out of 11 languages. If you want to change the WhatsApp language on your Smartphone then you have to take simple steps. Step 1: After open the WhatsApp on your smartphone tap on the three vertical dots > Choose Settings option. Step 2: Tap on the Chats option in WhatsApp Settings window. Tap on the “App Language” option and choose any required language which you want. By default English language is set on WhatsApp chat language window. If you regularly received messages on daily basis from any specific friend or group then you have to add chat shortcut at home screen. After add the WhatsApp chat shortcut at home screen on your smartphone you can quickly check received messages and send the messages. To add chat shortcut of WhatsApp you have to take given simple steps. Step 1: After open the WhatsApp on your smartphone tap on your specific friend or group which you want to add in chat shortcut. Step 2: Tap on the three vertical dots and choose Add chat shortcut option. Now you can check a confirmation message shown at your screen. WhatsApp bring his latest WhatsApp Pinned Chat features for his all Android phone users. If you have latest version of WhatsApp then you can take benefit of WhatsApp pinned chat feature at your Android phone. You can pin only up to 3 chats either for group or individual chats. WhatsApp pinned chat feature for Android phone is very handy for all those users who get WhatsApp messages randomly. To pin your chats on WhatsApp you have to take given simple steps. Step 1: Download and install latest WhatsApp version at your Android phone. Step 2: Tap and hold any particular chat or WhatsApp group which you what to pin. Tap on the pin icon at your WhatsApp window. A pin icon is shown in-front of your particular or group chat. Now when you receive any message then there is no need to scrolling the list of all conversation. You can view the received messages at the top of pinned WhatsApp chat. Sometime you need to highlight or underline some important thing during sending the messages to your friend or on a group from WhatsApp. At that time there is no choice to do this job. But if you have latest version of WhatsApp then you can easily bold and italic required specific words or lines during sending the messages. To do this you have to take few given simple steps. Step 1: Tap and hold any particular chat or WhatsApp group in which you make bold or italic words or lines during chatting. Step 2: If you want to make bold any specific word or line then put astrick symbol “*” before and end of the word or line. If you want to italic any specific word or line then put underscore symbol “_” before and end of the word or line.